UPDATE: The Rag neglected to mention that children aged 12 and under will be admitted free. On November 9th the Friends of Coyote Hills invite you to a five kilometer walk along trails of Fullerton to support the vision of preserving all of the undeveloped land in Coyote Hills as a nature park. Entitled “Walk for Coyote Hills – A Park for All,” the event begins at 9 a.m. and last until noon. Participants should plan to meet at the Fullerton Equestrian Center located at 2900 Lakeview Way. Automobile and bicycle parking will be available. The walk is described as a family friendly and easy 5K hike along the Laguna Lake and Juanita Cook Trails. Naturalist Stations will be located along the path to teach participants about the plants and animals living in the hills, the area’s watershed, and the Native Americans who once lived there. $ 15 for adults, $ 10 for teens. Prizes will be awarded to top fundraisers. Last year a sizable majority of voters decided they didn’t want the Pacific Coast Homes development approved by the Fullerton City Council for the former oil property. 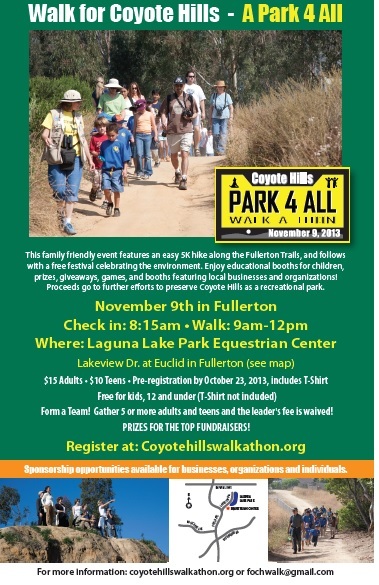 Those wishing to see the hills transformed into a nature park instead should vote with their feet on November 9 and support the Friends of Coyote Hills by walking the trails of Fullerton or making a donation on the event’s website. The link to the walkathon site is slightly broken.